Walnut is the common name for any of the large, deciduous trees comprising the genus Juglans of the flowering plant family Juglandaceae, which is known as the walnut family. Walnut is also the name for the nuts or edible, ridged seed of these trees, or for their hardwood. Walnut trees are found in temperate zones of North and South America, Europe, and Asia. Walnuts provide commercial, aesthetic, and nutritional value for human beings, while also providing value for the ecosystem in terms of offering a habitat and nourishment for many animals. The fruit can be quite nutritious for people, being an excellent source of omega-3 fatty acids and various vitamins and minerals, and has been shown to be helpful in lowering cholesterol, among other health benefits. The wood of some species of walnut is highly prized for its color, hardness, and grain, being used for furniture and other purposes. Walnut trees, genus Juglans, comprise the largest and most widely distributed of the eight genera in the walnut family Juglandaceae. The Latin name Juglans derives from Jovis glans, "Jupiter's acorn": figuratively, a nut fit for a god. The 21 species in the genus range across the north temperate Old World from southeast Europe east to Japan, and more widely in the New World, from southeast Canada west to California and south to Argentina. Walnut trees tend to be large, from ten to forty meters in height (30 to 130 feet). Walnut trees are characterized by large aromatic leaves that are pinnately compound, 200 to 900 millimeters long (about 7 to 35 inches), with 5 to 25 leaflets. The shoots have chambered pith, a character shared with the wingnuts (Pterocarya) but not the hickories (Carya) in the same family. The male flowers are arranged in catkins on shoots of the previous season, while shoots of the current season bear the female flowers. Walnut shoot cut longitudinally to show chambered pith. Scale in mm. The fruit is a true nut in the botanical sense. That is, it is a simple dry fruit with one seed in which the ovary wall becomes very hard (stony or woody) at maturity, and where the seed remains unattached or unfused with the ovary wall. The outer fruit wall is generally round, and leathery or woody. The shells, which may be thick or thin depending on the species, are usually deeply furrowed and the seeds are ridged. The word “walnut” derives from Old English wealhhnutu, literally "foreign nut," with wealh meaning "foreign." The walnut was so called because it was introduced from Gaul and Italy. The previous Latin name for the walnut was nux Gallica, "Gallic nut." The best-known member of the genus is the Persian walnut (Juglans regia), also known as the English walnut. It is native from the Balkans in southeast Europe, southwest and central Asia, to the Himalayas and southwest China. Its common name, Persian walnut, indicates its origins in Persia (Iran) in southwest Asia, while the term English walnut reflects the fact that for centuries English ships transported it worldwide (Bender and Bender 2005). In Kyrgyzstan alone there are 230,700 hectares of walnut-fruit forest, where J. regia is the dominant overstorey (Hemery and Popov 1998). This is the species that is widely cultivated for its delicious nuts. 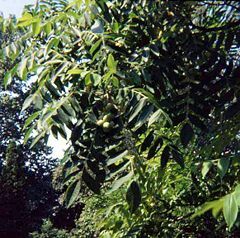 The black walnut (Juglans nigra) is a common species in its native eastern North America, and is also widely cultivated elsewhere. The nuts are edible, but have a smaller kernel and an extremely tough shell, and they are not widely grown for nut production. However, they are of importance for timber, yielding a dark, hard walnut wood. The butternut (Juglans cinerea) is also native to eastern North America, where it is currently endangered by an introduced disease, butternut canker, caused by the fungus Sirococcus clavigignenti. Its leaves are 40 to 60 cm long, and the nuts are oval. It also is timbered, but has softer wood than the black and Persian walnuts. The seed is of local importance. The Japanese walnut (Juglans ailantifolia) is similar to butternut, distinguished by the larger leaves up to 90 cm long, and round (not oval) nuts. Sect. Juglans. Large leaves (20–45 cm) with 5–9 broad leaflets, hairless, margins entire. Wood hard. Southeast Europe to central Asia. Sect. Rhysocaryon. Large leaves (20–50 cm) with 11–23 slender leaflets, finely pubescent, margins serrated. Wood hard. North America, South America. Sect. Cardiocaryon. Very large leaves (40–90 cm) with 11–19 broad leaflets, softly downy, margins serrated. Wood soft. Northeast Asia, eastern North America. Interplanting walnut plantations with a nitrogen fixing plant such as Elaeagnus × ebbingei or E. umbellate, and various Alnus species results in a 30 percent increase in tree height and girth (Hemery 2001). When grown for nuts, care must be taken to select cultivars that are compatible for pollination purposes. Although some cultivars are marketed as "self fertile" they will generally fruit better with a different pollination partner. There are many different cultivars available for growers, offering different growth habit, flowering and leafing, kernel flavor, and shell thickness. A key trait for more northerly latitudes of North America and Europe is phenology, with "late flushing" being particularly important to avoid frost damage in the spring. Some cultivars have been developed for novel "hedge" production systems developed in Europe and would not suit more traditional orchard systems. Walnuts are used for their edible fruit, their wood, and their ornamental purposes. The sap is sometimes used for production of sap, and they have been used for dyes. The trees also are important ecologically. The nuts of all the species are edible, but the walnuts commonly available in stores are from the Persian walnut, the only species that has a large nut and thin shell, with the edible portion most easily separated from the shell. A horticultural form selected for thin nut shells and hardiness in temperate zones is sometimes known as the "Carpathian" walnut. Nuts are rich in oil, and are widely eaten both fresh and in cookery, as well as for flavorings and confectionery. Walnut oil is expensive and consequently is used sparingly; most often in salad dressing. Walnuts are also an excellent source of omega-3 fatty acids, and have been shown as helpful in lowering cholesterol. They are a rich source of vitamin E, copper and selenium and a good source of protein, iron, niacin, and vitamin B1 (Bender and Bender 2005). A 60-gram portion (nine nuts) contains 40 grams of fat, of which 10 percent is saturated and 75 percent is mono-unsaturated (Bender and Bender 2005). Walnuts need to be kept dry and refrigerated to store well; in warm conditions, they become rancid in a few weeks, particularly after shelling. In the shell, they may stay well for up to three months if kept in a cool and dry place, while shelled nutmeats may stay up to six months if refrigerated and tightly covered (Herbst 2001). In some countries, immature nuts in their husks are preserved in vinegar. In England, these are called "pickled walnuts" and this is one of the major uses for fresh nuts from the small-scale plantings. In Armenian cuisine, walnuts are preserved in sugar syrup and eaten whole. In Italy, liqueurs called Nocino and Nocello are flavored with walnuts. In Georgia, walnuts are ground along with other ingredients to make walnut sauce. Walnuts are heavily used in India. In Jammu, India it is used widely as a prasad (offering) to Mother Goddess Vaisnav Devi and, generally, as a dry food in the season of festivals such as Diwali. Walnut husks are often used to create a rich, yellow-brown to dark brown dye that is used for dyeing fabric and for other purposes. When picking walnuts, the husks should be handled wearing rubber gloves, to avoid dyeing one's fingers. Oil paint also often employs walnut oil as an effective binding medium, known for its clear, glossy consistency and non-toxicity. The Persian walnut, the black walnut, and its allies are important for their attractive timber, which (except in young trees) is hard, dense, tight-grained, and polishes to a very smooth finish. The color ranges from creamy white in the sapwood to a dark chocolate color in the heartwood. When kiln-dried, walnut wood tends toward a dull brown color, but when air-dried can become a rich purplish-brown. Because of its color, hardness, and grain, it is a prized furniture and carving wood. Walnut burls (or “burrs” in Europe) are commonly used to create bowls and other turned pieces. Veneer sliced from walnut burl is one of the most valuable and highly prized by cabinet makers and prestige car manufacturers. Walnut wood has been the timber of choice for gun makers for centuries, including the Lee Enfield rifle of the First World War. Today, it is used for exclusive sporting guns, by makers such as Purdey of London. The wood of the butternut and related Asian species is of much lower value, softer, coarser, less strong and heavy, and paler in color. Walnuts are very attractive trees in parks and large gardens. The Japanese walnut in particular is grown for its huge leaves, which have a "tropical" appearance. Walnuts are not particularly well suited to smaller urban gardens. They drop numerous small twigs, leaves, branches, or nuts, so are considered "messy" by some people; the falling nuts in late summer and early autumn can be quite dangerous. Both the fallen leaves and the roots secrete a substance called juglone, which kills many popular garden plants, such as tomato, apple, and birch. All walnuts produce juglone, but black walnuts produce larger amounts than other species. Juglone appears to be one of the walnut's primary defense mechanisms against potential competitors for resources (water, nutrients, and sunlight), and its effects are felt most strongly inside the tree's "drip line" (the circle around the tree marked by the horizontal distance of its outermost branches). However, even plants at a seemingly great distance outside the drip line can be affected, and juglone can linger in the soil for many years even after a walnut is removed, as its roots slowly decompose and release juglone into the soil. The Coleophora case-bearers C. laticornella (recorded on J. nigra) and C. pruniella. Walnuts provide a number of nutrients and are valued for their cholesterol-lowering properties. There is some evidence that eating walnuts after a meal high in unhealthy fats can reduce the damaging effects of such fats on blood vessels (Cortes et al. 2006). Researchers from Barcelona's Hospital Clinic conducted a study on 24 adult participants, half of whom had normal cholesterol levels, and half of whom had moderately high levels of cholesterol. Each group was fed two high-fat meals of salami and cheese, eaten one week apart. During one meal, the researchers supplemented the food with five teaspoons of olive oil. The researcher added eight shelled walnuts to the other meal, the following week. Tests after each meal showed that both the olive oil and the walnuts helped reduce the onset of dangerous inflammation and oxidation in the arteries after the meals, which were high in saturated fat. However, unlike the olive oil, the walnuts also helped the arteries maintain their elasticity and flexibility, even in the participants with higher cholesterol. Lead researcher Dr. Emilio Ros said walnuts' protective effects could be because the nuts are high in antioxidants and ALA, a plant-based omega-3 fatty acid. Walnuts also contain arginine, which is an amino acid that the body uses to produce nitric oxide, necessary for keeping blood vessels flexible. A study by the NYS Institute for Basic Research in Developmental Disabilities found that walnut extract was able to inhibit and defibrillize (break down) fibrillar amyloid beta protein—the principal component of amyloid plaques in the brains of patients with Alzheimer's disease (Chauhan et al. 2004). The study looked at the effect of walnut extract on amyloid beta protein fibrillization by Thioflavin T fluorescence spectroscopy and electron microscopy. These results suggest that walnuts may reduce the risk or delay the onset of Alzheimer's disease by maintaining amyloid beta protein in the soluble form. In traditional Chinese medicine, walnut seeds are primarily considered a kidney tonic. They are also considered beneficial to the brain, back, and skin, and to relieve constipation if it is caused by dehydration. Chauhan, N., K. C. Wang, J. Wegiel, and M. N. Malik. 2004. Walnut Extract Inhibits the Fibrillization of Amyloid Beta-Protein, and also Defibrillizes its Preformed Fibrils. Current Alzheimer Research 1(3): 183–188. Retrieved January 21, 2008. Cortes, B., I. Nunez, M. Cofan, R. Gilabert, A. Perez-Heras, E. Casals, R. Deulofeu, and E. Ros. 2006. Acute effects of high-fat meals enriched with walnuts or olive oil on postpradial endothelial function. Journal of the American College of Cardiology 48(8). Retrieved January 21, 2008. Hemery, G. E., and S. I. Popov. 1998. The walnut (Juglans regia L.) forests of Kyrgyzstan and their importance as a genetic resource. Commonwealth Forestry Review 77: 272–276. Hemery, G. E. 2001. Growing walnut in mixed stands. Quarterly Journal of Forestry 95: 31–36. Flora of North America: Juglans. This page was last modified on 17 October 2016, at 18:59.